An enlightening look into the medical, cultural, religious and philosophical implications of life extension. ‘Can We Live Forever?’ addresses the modern debate about the Life Extension Project that results from revolutions (actual and predicted) in bio-medicine, transplantation, cosmetic surgery, genetic counseling, stem cell research, cryonics, cloning and so forth that cumulatively promise to deliver eternal life or at least 'prolongevity'. In an engaging and thought-provoking work, the author traces the rise of the Life Extension Project and its claims against an intellectual background of recent analyses of 'waste', sustainable environments and complexity theory. Although there has been much discussion of increasing life expectancy, this book looks at a range of additional issues: the religious implications of life extension; the psychological consequences, such as ennui; the negative global social and economic factors; the problems of intergenerational justice. 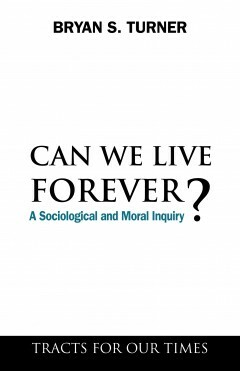 The possible benefits and adverse consequences of living forever are fully explored in this illuminating text, offering substance to social scientists working on ageing and demographic change, philosophers interested in questions of continuity and identity, theologians concerned with secular changes in the life course, as well as the general reader. Bryan S. Turner is the Alona Evans Distinguished Visiting Professor of Sociology at Wellesley College, USA.